Radios are common in society today. Radios are used for many purposes in everyday life. Radio technology have been present for many decades, however it was not until the 1920s that people bought and kept radios in their homes just for entertainment purposes. Radios were used significantly during World War II. Radios were the ultimate communication for passing along crucial tactics to the soldiers. James Clerk Maxwell, a Scottish physicist in 1860s, had come across radio waves. In 1886, Heinrich Rudolph Hertz, a German physicist also demonstrated that electric currents with varying and fast speed could be sent into space as radio waves just as the light and heat waves. But even before that Mahlon Loomis, who was an American dentist had successfully displayed the experiment of wireless telegraphy. To display his invention, Loomis connected a meter to one kite and showed how the other kite moved because of this connection. This was the first ever demonstration of wireless air communication. The model of our project was a simple working AM radio receiver. This is pretty much the entire main body of our project because we actually put together an AM receiver. Since the model of our project is so simple one can see just exactly how the electricity and waves flow through our receiver. When making the model we just simply followed a schematic of how to put all the components together. Following the schematic, we put this model together using several components. These components were: a 100-kilo ohms resistor, a .001microfarad fixed-value capacitor, a 400 pico-farad tuning capacitor, a crystal earpiece and an aerial coil. Together these components made up our receiver. When one hears the sound through the crystal ear piece the sound is exceptionally low and one can barely hear it. The reason this sound is so low is because there is no amplifier. The amplifier would normally make the sound louder. The amplifier allows the sound to be magnified enabling more decisive hearing. To understand how a radio works, one must first understand electricity. Electricity is a steady stream of electrons that create a magnetic field. This field is strong enough to affect a compass. It is essential to understand this before one can understand how a radio works. For a radio to work there two basic parts, a receiver, which receives the signal transmitted, and a transmitter, which transmits the signal for the receiver to pick. Both of these are necessary for a radio to work. A receiver has an antenna, which allows it help to pick the transmitters radio wave out of the air. An antenna is simply a wire or metal stick that increases the amount of metal the transmitter’s wave can interact with. The receiver also needs a tuner. The tuner works to separate one desired wave from the thousands of radio signals that the antenna receives. Tuners work by using a principle called resonance. The tuner resonates one particular frequency and ignores all other frequencies in the air. The transmitter works to send out the signal to the receiver. The transmitter works virtually the same. The single difference is that instead of receiving signals it is producing them. 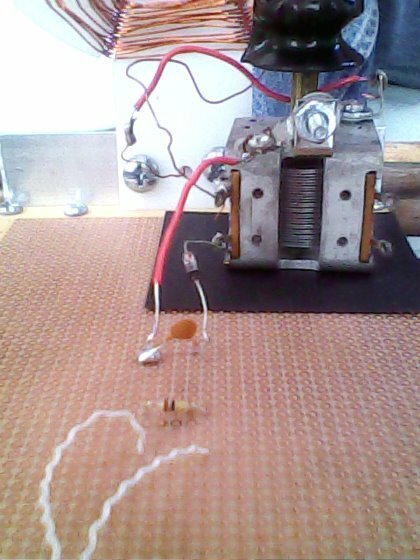 The transmitter converts a wave into an electromagnetic wave that the receiver can pick up. The radio transmitter has to put the electromagnetic wave into a sine wave so that the receiver can properly pick up the signal. A characteristic of one of these sine waves is the frequency. Frequency is the number of times that a sine wave oscillates, or moves up or down, per second. If a transmitter transmits the sine wave into open space with a radio antenna then there is a radio station. Radio waves are a kind of wave called an electromagnetic wave. These electromagnetic waves consist of interchanging magnetic and electric fields. These fields and waves are continually being recreated and traveling through empty space at the speed of light, or exactly 299,792,458 meters-per-second (which is approximately 186,282 miles-per-second). When the electrical current in an antenna speeds up, this creates a radio wave. This allows radios the efficiency needed to send the reception to the antenna in a quick manner. Varying electric charges produce varying waves. While a steady current produces a steady or constant wave, the radio wave emitted by a vertical transmitting antenna has a vertical polarization. While a wave emitted by a horizontal antenna has a horizontal polarization. In vertical polarization, polarization electric fields point alternatively up or down. In horizontal polarization the fields point alternatively left and right. In a radio transmitter the antenna uses the same basic process of electricity converts a sine wave into an electromagnetic wave so that a receiver can pick up this transmitted signal. Radio waves which are a part of the electromagnetic spectrum have the ability to transmit speech, pictures, music and other types of data through air invisibly. The second part of a radio is the receiver. The receiving end of the radio is what picks up the sine wave that is transmitted by the transmitter. The frequency that is received is measured in hertz or cycles per second (ex. 720AM would be at frequency of 720,000 hertz). When you receive the signal, the radio modulates the music or voices into a carrier wave. This carrier wave varies how high or low the sine wave of the transmitter. The radio receiver has to have an antenna to pick up the transmitter's signal; an antenna is simply a metal post or wire that allows in the flow of the sine waves. Along with an antenna a radio receiver needs a tuner. The tuner basically cuts out certain frequencies and lets one focus in on just one certain frequency. The receiver then demodulates the waves to make audible sound. In an AM radio a diode (usually made of an element called germanium) cuts half the sine wave and allows the wave to only flow in one direction. Finally the receiver uses an amplifier to amplify this cut signal and sends it to a speaker or headphones. Recent radio technology is involving more satellite radio waves. New companies such as Sirus radio have created such signals allowing digital radio signals. As wells new radio companies have started to allow genre and preference oriented radios allowing further personalization. Within new cars digital radios can be voiced activated, allowing hand-free service. DAB Digital Radio, which is also known as digital audio broadcasting, is an entirely new system for broadcasting and receiving radio stations. As the name indicates signals are broadcast in a digital format to enable CD quality to be achieved. DAB has shown a significantly better sound quality as a new radio system. Also it does not suffer from the multipath effects often experienced on FM transmissions and as the system uses what it known as a single frequency network (SFN) there is no retuning required when moving from one coverage area to the next. Without having to have a return signal, theses digitals radios don’t need to have many transmitting signals. This new radio technology is seen in many different settings. Cars, phones, and also many different media devices. With digital products, the smaller the device the better the quality. Another new trend in radio technology is podcasting. Since the release of the Apple Ipods many broadcasters have switched to Podcasting. Podcasting incorparates having your own station with being able to open your broadcasts to the world. Podcasting allows you send your broadcast digitally through the use of the internet along with other mediums to project your broadcasts. Podcasting is very efficent and enxspensive. We built a model of an AM radio receiver to show just how exactly the radio signal flows through the the radio. We did our project on the radio because it is an everyday object that uses physics. As stated earlier, the radio is a type of technology that has been around for years. The physics involved in the actual running of a radio is very substantial. The radio is a specific peice of technology that uses physics to transmit wave signals to the receiver. The speed of the wave is so fast that it makes reception almost immediate. 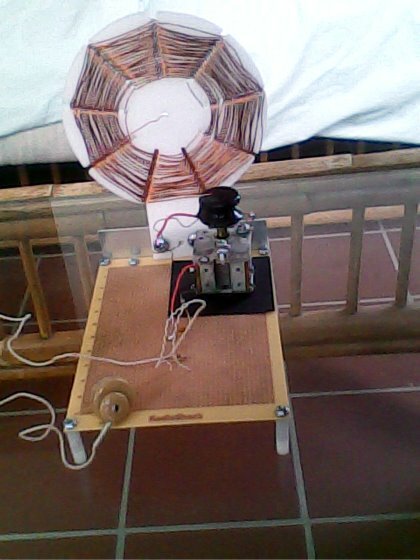 We also wanted to use a radio beacause we wanted to construct our own model. We wanted to make our own model. In doing so, we wanted it to be a working model to represent the many concepts that we were trying to leaern. Being able to constructed an actual radio reciever was very helpful in understanding how a radio actually works. There are many different aspects in radios. Radios are highly involved in physics. With the use of magnetic waves, radios are able to send the signals over various distances in very short instant amounts of time. The flow of the signal, through the receiver is constant which allows a clear signal if your receiver is setup properly. Improving the quality of radios can be done in various ways. By extending the length of the antenna you will be able to have a clearer reception. Also using an amplifier will help in the sound quality of the broadcast. The amplifier will help in being a beneficiary accoutrement to the sound being broadcast. Through this project we learned how the flow of wave signals causes the transmitting of data that can be heard through the use of a radio. The flow of the radio wave is very fast, which leads to its quick access to the receiver. We also learned about new trends of technology that have risen from the simple concept of broadcasting. More people are able to broadcast their media to more people. Effects of the radio have influenced the election of officials, broadcasted sporting events, and other various media. As more advancements with digital radios continues to grow, radio technologies will continue to expand and be used in ways no one thought possible.